The Sanken COS-11D Miniature Lavalier Microphone delivers the audio performance that meets the standards of high-definition audio systems. The wide frequency response ensures accurate, transparent audio reproduction and its omnidirectional polar pattern provides a generous pickup area while minimizing feedback and off-axis noise. This COS-11D features 1/8″ (3.5mm) mini connection for Sennheiser EW series wireless transmitters. The wide frequency response, low noise and transparent audio reproduction meet the demands of high-definition audio sound-reinforcement and recording systems. The miniature profile of the lavalier makes it an ideal solution for professional theater, video recording, film and broadcast applications. I like the looks, well, sound of this mic. I have seen other places with these mics, and they mentioned battery or phantom as options. Does this model require power? 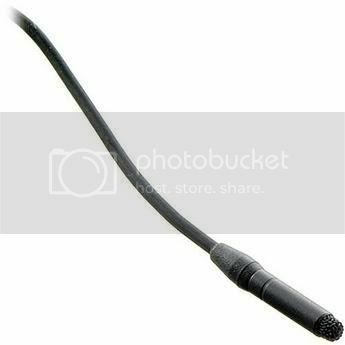 I am also interested in a possible XLR option. I will use it with my G3 system mainly, but there may be a situation where I just want to go straight in for better sound. Can I have my cake and eat it too? Thanks Guy! Your response didn’t go to my email so I just saw it here while dreaming about the Sanken COS-11 Lavalier again. I’m glad to hear I can “XLR-ize my mini plug for $129.00. This baby is still on the “to-get” list, but I am still reeling from dropping 2,500.00 on a tripod: Sachtler FSB-8 with some Gitzo 78″ Carbon legs. Gawd! Can you get the COS-11X for the same price? I want the X. Hey guys I made a comparison video between the COS-11D and the Sennheiser ME-2. Feel free to use it, or download it to use elsewhere.